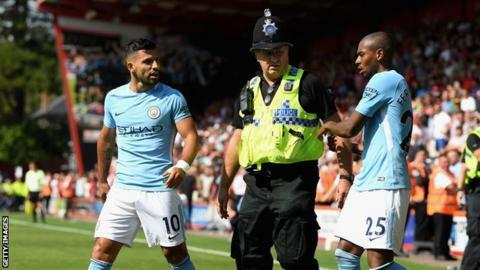 Bournemouth say a "misunderstanding" led one of their stewards to allege he was struck by Manchester City's Sergio Aguero during Saturday's Premier League game at Vitality Stadium. The incident was alleged to have happened after Raheem Sterling's 97th-minute goal gave City a 2-1 win. Sterling then ran to celebrate in front of the away supporters, and several City fans went on to the pitch. Aguero was then seen to be involved in an exchange with a steward. Police had earlier taken a statement from a steward but the Cherries later said it had been withdrawn and "no assault took place". Sterling, who had already been booked, was sent off after being shown a second yellow card for his celebration. In a statement, Dorset Police said two male spectators from Manchester were arrested following the incident. The statement added officers were "reviewing CCTV of the pitch encroachment as part of an ongoing investigation to establish whether any other offences may have been committed".